My final top four of the regular season is Clemson, Alabama, Michigan State, and Stanford, after each team won their conference championship game. Oklahoma is the odd man out, after not playing this week and only playing 12 games this year, compared to 13 by the four teams ahead of them. 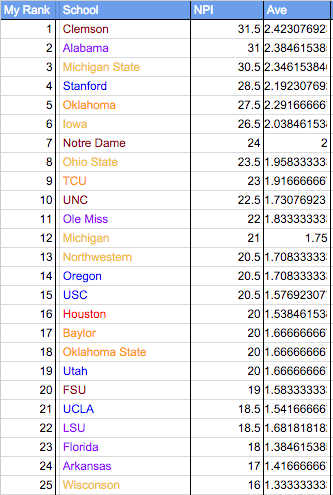 Their average per game is actually higher than Stanford’s, but Oklahoma can’t get credit for a game they didn’t play now that we’re at the end of the season. 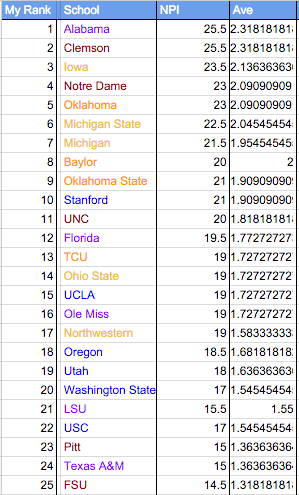 I’m guessing the Playoff Committee will put Oklahoma in, but going by my metric, I’d leave them out. After the championship games this weekend, the only non-bowl game left is Army/Navy. There are only two weeks left in the college football season, but they’re the most important of the year and could cause the most movement in the ranks. Rivalry week will bring up key games between ranked teams: Florida vs. FSU, Notre Dame vs. Stanford, Baylor vs. TCU, Oklahoma vs. Oklahoma State, Ohio State vs. Michigan, UCLA vs. USC, Texas A&M vs LSU, and Ole Miss vs. Mississippi State. Also, one-loss Navy and Houston will square off to see which team was the best of the mid majors this season, and the winner will most likely find themselves in the top 25 at season’s end. The most notable losses this week were Ohio State and Oklahoma State, but former undefeated teams that lost to games against their conference’s toughest competition. Oklahoma State still has an outside chance if they take care of business against Oklahoma, and some of the team’s ahead of them fall. Ohio State needs a lot of help from things out of their control and would have to win against two really difficult opponents to jump up into the top 4. It could happen, but it’s highly unlikely. One team to keep an eye on is North Carolina. They haven’t lost since the first week of the year, and if they can somehow upset Clemson in two weeks, they would have a really strong resume. Probably not top-4 worthy, but it’s cool to see a new face near the top. There are only three weeks of games left before the College Football Playoff, but there is still plenty of time for things to change near the top of the polls with rivalry week and conference championship games on their way. 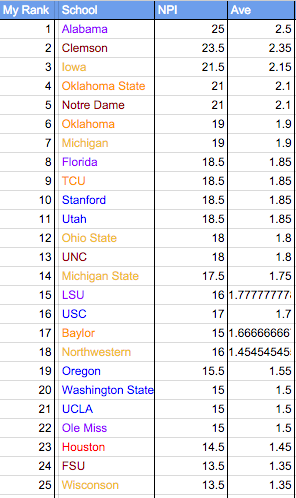 One rank I would like defend is Ohio State at 12. I know they’re defending champions and they’re undefeated, but the best two teams they’ve played this season are Minnesota and Penn State, neither of which are all that impressive, and they haven’t completely blown out the weak teams they’ve been up against either. This shows that these ranks are doing their job: to grade a teams based on what they’ve done so far this season, and not to factor in their preseason perception. Also, just because Ohio State is ranked 12 doesn’t mean they’re far out of the playoffs. Their last three games will be against Michigan, Michigan State, and Iowa in the Big 10 Championship game, and if they win all three, there’s no way they get left out. Another similar situation has been happening in the Big 12. The top teams in the Big 12 were all lower than their record would probably indicate for the majority of this season because they all scheduled their hardest games the last three weeks of the season. Therefore, even with one loss already, Oklahoma, TCU and Baylor have a chance to really jump up the rankings if any of them go through these last three games unscathed. That would, however, require them to beat undefeated Oklahoma State, who’s the best chance for the conference to cement themselves in the playoff picture. There were a lot of games between ranked teams in week 10, and as a result a lot of change near the top of the rankings. Clemson clinched their division, and beat FSU for the first time in four seasons, making them a pretty strong number 1 with a really good chance to go undefeated. Even with one loss, Alabama cemented themselves in the playoff race by beating LSU. TCU, who hadn’t been tested by a decent team all season, lost big to Oklahoma State, who is now up in the top 4 and has two more chances to impress to close out the season. 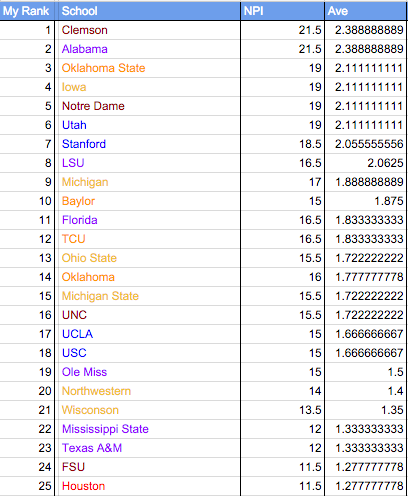 Also in the top four, Iowa, probably the most consistent Big 10 team this season. Iowa’s only flaw is they have had a very week schedule and their only chance of being test is in the Big 10 Championship game. Undefeated teams that lost this week were LSU (dropped from 1 to 8),TCU (3 to 12), Michigan State (8 to 15), Memphis (21 to unranked), and Toledo (23 to unranked). There’s the USA Today Coaches Poll, The Harris Poll, The Legends Poll, and now, one week before the start of college football, I would like to introduce The Deli Poll, the newest measure of college football success.